Wollongong, informally referred to as "The Gong", is a seaside city located in the Illawarra region of New South Wales, Australia. Start off your visit on the 18th (Thu): contemplate in the serene atmosphere at Nan Tien Temple, then stop by Starfish Education Centre, and then explore the striking landscape at Kiama Blowhole. Keep things going the next day: enjoy the sea views from Wollongong Head Lighthouse, pause for some photo ops at Lawrence Hargrave, and then admire all the interesting features of Grand Pacific Drive - Sydney to Wollongong and Beyond. For reviews, where to stay, photos, and tourist information, you can read our Wollongong trip itinerary site . Sydney to Wollongong is an approximately 1.5-hour car ride. You can also take a train; or take a bus. Traveling from Sydney in April, you can expect nighttime temperatures to be a bit cooler in Wollongong, with lows of 13°C. Finish your sightseeing early on the 19th (Fri) so you can take a bus to Jervis Bay. On the 20th (Sat), stroll through Callala Beach, then kick back and relax at Collingwood Beach, and then kick back and relax at Hyams Beach. For traveler tips, ratings, reviews, and more tourist information, read Jervis Bay travel itinerary planner. You can take a bus from Wollongong to Jervis Bay in 3 hours. Other options are to take a train; or do a combination of train and bus. 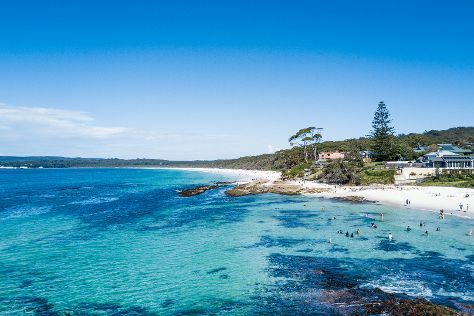 In April in Jervis Bay, expect temperatures between 26°C during the day and 14°C at night. Finish your sightseeing early on the 20th (Sat) to allow enough time to take a train back home.